With a modern reinterpration of period style pendant lighting, the lighting design studio Niche Modern presents the Haus Series - the Coolhaus Pendant and the Schoolhaus Pendant. 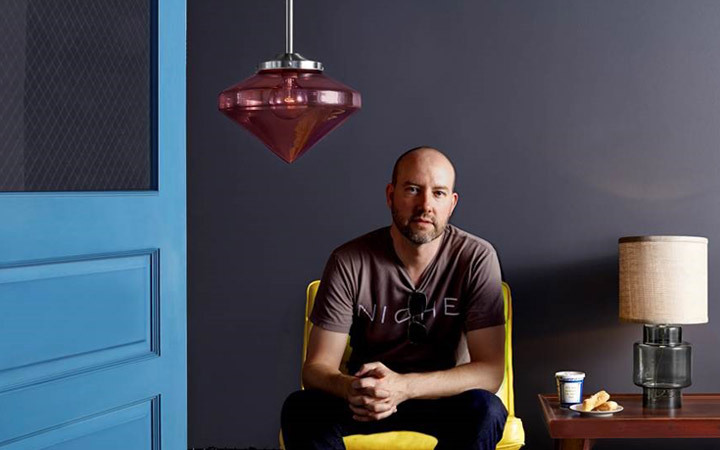 We went Behind the Design of these gorgeous glass designs with the founder of Niche Modern, Jeremy Pyles. What does "modern design" mean to you? Design with no superflous-ness. Economy of line and shape. What word best describes the process of creating the Haus Series? So, why "Haus" and not "House" in the naming? The Haus Series is based on inspiration from the past but reinterpreted with a modern perspective on color and form, much like the Bauhaus considered design to be the "total" work of art combining art and craft equally. 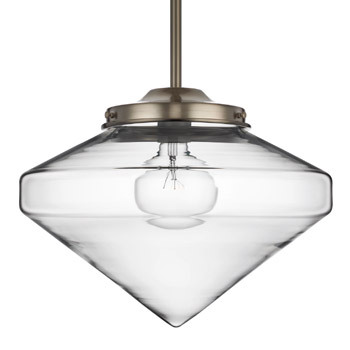 The Schoolhaus and Coolhaus pendants sound like they were made for each other. How do you envision them playing off each other, if at all? To me, they are both period pieces. The Schoolhaus is more traditional Americana whereas the Coolhaus is full of optimism for the future that inspired the design scene in the twenties. The minute anyone says that they don't belong together or pair gracefully, someone will do so in an imaginative and inspired way. My purpose is to launch them into the world at large -- what happens after that is out of my hands and I will say that I have been quite surprised in the past at how creatively designers and architects have mixed and matched shape and color with Niche Modern products with stunning results that I personally wouldn't have even considered! 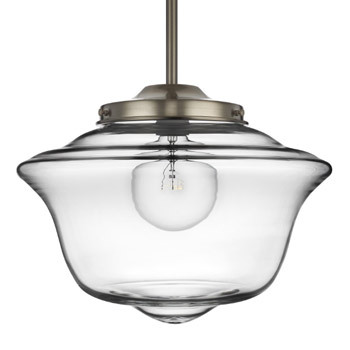 Inspired by nostalgic historic glass shapes, the Niche Schoolhaus Pendant neatly balances tradition with beauty. As with all of our pendant lights each piece is hand-blown in New York, keeping alive the timeless craft of glass blowing. Niche’s signature transparent glass colors create a modern and sophisticated take on this iconic silhouette making it an object of antiquity to be loved by generations to come. You said the inspiration behind the Schoolhaus pendant was the traditional schoolhouse pendants in Clinton Street Bakery in NY. Aside from the lighting, what do you love most about that bakery? I love the feel of the bakery and how timeless the environment is. Is it from 2010 or 1940? I think good design can transport you to another time and place, even if just for a second while you are ordering your coffee and croissant. If you could design one room around the Coolhaus pendants, what would it look like? I recently stayed at the Biltmore Hotel in Scottsdale for the second time and I love that environment. You can almost envision Frank Lloyd Wright bustling through the space in a whirlwind. It is refined and elegant, yet still playful. That is the kind of environment I hope to see the Haus Series employed in. What feelings do you hope these pendants will evoke in people? 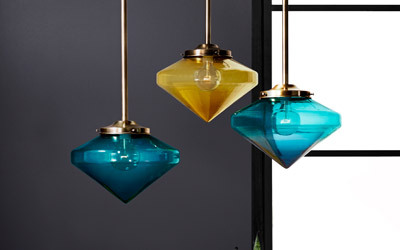 I know the shapes will resonate with people as they evoke the feel of past decades, but used in transparent vibrant colored glass, I want people to be surprised by how these nostalgic designs are still fresh and modern and relevant. Do you have plans to add more pieces to the Haus collection? No, but I often change my mind and contradict myself so I'd like to reserve the right to surprise us all if I come across any period lighting that fits the mantra of the Haus Series.